LA PAZ, Bolivia, September 24, 2012 (ENS) – President Evo Morales has signed into law a measure to safeguard Bolivia’s Amazon pink river dolphin and assigned the country’s armed forces to protect the rare species. “It is our duty to protect animal species from all over Bolivia. 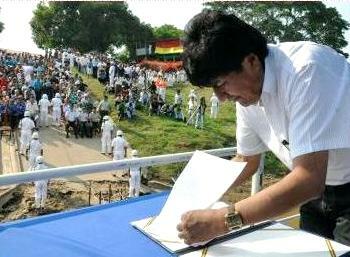 The Armed Forces will contribute to environmental conservation,” said President Morales, after signing the law that declares the dolphin to be part of Bolivia’s Natural Heritage. President Morales issued the Bufeo Protection Act on September 18 at a ceremony in Trinidad, the capital of Beni Department in the country’s northeast. Beni is criss-crossed by numerous rivers, all tributaries of the Amazon, which are inhabited not only by the Amazon river dolphin but also by over 400 species of fish. Bolivian river dolphins are one of three subspecies of Inia geoffrensis, known scientifically as I.g. boliviensis. Known as bufeo in Spanish, these freshwater mammals are known in English as boto, boutu, pink river dolphin in addition to being called Amazon River dolphin. 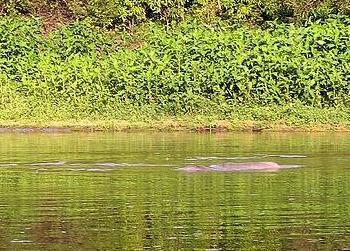 Bolivia’s pink river dolphin is one of the largest river dolphins. On average, males measure up to 2.55 meters in length and can weigh 160 to 180 pounds, while females grow up to 2.16 meters and can weigh close to 100 kilograms. These dolphins have large cheeks which may obstruct their downward vision. Scientists speculate that this may be the reason they are often seen swimming upside down. Amazon pink river dolphins are slow swimmers and are usually seen alone or in pairs, except during the dry season when they gather in groups of 10 to 15 animals. The new law bans deliberate killing, the most serious threat to Amazon river dolphins. A major threat to their survival is fishing and it is now illegal to catch them. Fishing with explosives, although illegal in most areas, is common in some areas of the Amazon Basin. This fishing technique threatens the dolphins due to the concussive effects of explosions. Fishermen have been known to kill dolphins that are attracted to prey on the stunned or dead fish. Other threats include pollution from mercury used in illegal gold mining, dam construction and erosion, which destroys their river habitat. “We would also urge the Bolivian government to address the other threats that these dolphins still face including the construction of dams in the north of the country and to support WDCS’s Bolivian river dolphin expert, Enzo Aliaga-Rossel, in his efforts to protect Bolivian river dolphins,” said Wood. The species was previously listed as Vulnerable to extinction on the IUCN Red List of Threatened but is now considered Data Deficient due to the limited amount of current information available on threats, ecology, and population numbers and trends.